The story moves around the characters have been drawn from the many men and women you do chance to meet up with if you take a leisurely walk in the parks around the Defence Colony of Delhi. The initial chapters of the book have been dedicated to each of the pivotal characters- introducing them to the readers like- A Colonel whose wife tags along wherever he goes, an Admiral whose lonesome life style bothers him secretly. A General, who happened to be a terror in his youth, gets grounded by his strict daughter in his old age. It is said old age is second childhood for any human being. So when the guns and Line of Control tensions start to wash away from their lives- the Soldiers of our country fall in line with the civilians. Their lives are no different than men and women who have spent their lifetime in cities and towns rushing to work place, raising children- getting them married off and now spending their last days being lonesome to the core.It is more like a diary- trespassed with witty jokes and insinuation that uphold the Army culture. 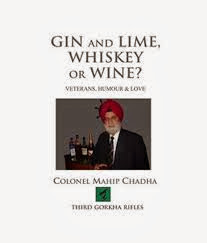 Throughout the book- Col Maiip Chadha’ has taken a strong stand against the negligence the army personnel suffer from the Bureaucrats and the politicians. It is sad to read that on side chief minster hands out meager awards to the next of kin of the martyred majorand on the same day he gives away a handsome amount of compensation to civilians who lost their relatives in a liquor catastrophe. The mockery is apparent- the man who got killed in line of action never receives his true respects from his country men who choose to spend their life thoughtlessly. “Gin and Lime, Whiskey or Wine?” is not a question asked by a bar tender flashing you his smile against the neon lights and loud music of the downtown nightclub. To unfold the same you need to read this book. The concept is good, the twist and turn in each character's life are interesting as well as give you another view point towards life. The author has narrated the story well. The characters are very well explained. This is a great achievement by Author. Though the title of the book is different altogether but goes with the story and ending. Overall if asked I would say...this is a high-quality work done by Author… (Mahip Chadha) I would give 4 stars to this book.